← Bring the world to your home: Share dinner with Fulbright students! 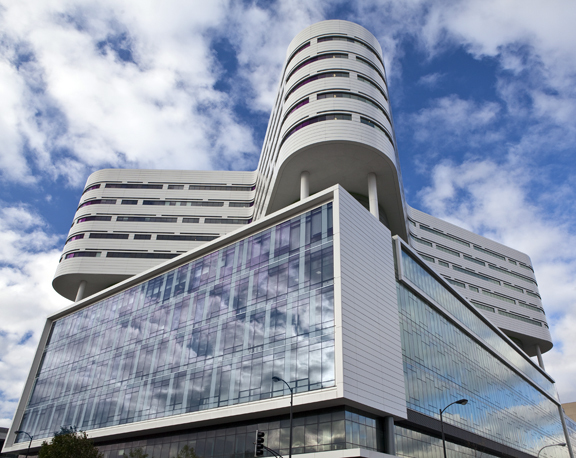 The impressive Rush Hospital has a curving tower dedicated for patients rooms atop a rectangular base where the diagnostic and treatment facilities are located. THE FULBRIGHT ASSOCIATION-Chicago Chapter in partnership with Rush University Medical Center will be hosting an exciting event on Saturday, March 10, 2012. Chicago’s reputation as the home to world-class architecture is evident once more in the new Rush Hospital 14-story tower designed by renowned architect Ralph Johnson, Design Principal for Perkins+Will. A tower of light, technology, sustainability, and innovative planning, this new hospital looms over the western entrance to the city, revitalizing the area and renewing the hospital’s commitment to state-of-the art equipment, facilities, and exemplary patient care. Peter W. Butler, President and Chief Operating Officer of Rush University Medical Center, will be presenting “An Overview of the American Healthcare System” with a Question and Answer session to follow. Directly after the talk, attendees will be guided on an architectural tour of the new Rush Hospital. RSVP to Ron Harvey (Fulbright Association-Chicago Chapter Secretary) at fulbrightchicago@gmail.com; indicate your name and Fulbright affiliation (Alumni/Scholar/Student) when you respond. COST There is no charge for this event. This entry was posted in Fulbright and tagged american healthcare system, Architectural Tour, Chicago, Chicago Chapter of the Fulbright Association, class architecture, Fulbright, fulbright association, Rush Hospital. Bookmark the permalink.